Maha Kumbh Mela will be held from January 27, 2013 to February 25, 2013 in Allahabad . Pilgrims attending for the Kumbha Mela 2013, take the chance to visit the tourist places and important temples located in and around Allahabad City. Allahabad(Prayag) is the second oldest city in India with an Enriching History of the Mythological times to Mauryan and Gupta Empires to Mughal Empires has its fare share of advantages.There are many attractive and oldest tourist places located here. Allahabad Fort: The massive Fort was built by Emperor Akbar in 1583A.D. 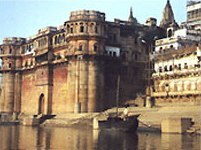 The Allahabad Fort stands on the banks of the river Yamuna near the Triveni Sangam. This huge, magestic Fort has three magnificent galleries flanked by high towers. At present the Fort is used by the Indian Army and only a limited area is opened to Visitors. Inside the Fort, most important and allowed places are 1) Ashoka Pillar, 2)Saraswati Kup, 3)Patalpuri Temple and 4)Akshaya Vat. Allahabad Fort Telephone Numbers : 0532-2504735/36. 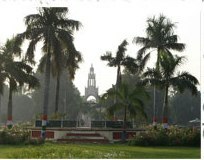 Minto Park: It is situated near Saraswati Ghat. It has a Stone Memorial with a fountain Symbol on Top. The park foundation was laid by Lord Minto in 1910. 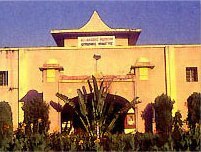 Jawahar Planetarium: For a Celestial trip of the Scientific kind, it is worthy to visit the Jawahar Planetarium. Timings : 11:00am to 4:00pm. Closed on every monday and on 4th Thursday of the month. 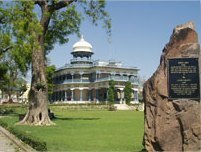 Allahabad Museum: The Allahabad Museum has a good collection of Sculpture especially of the Gupta Era. 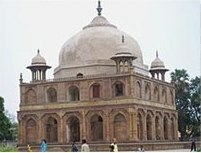 Khusro Bagh: Khusro Bagh is a Large Garden in which tombs of Khusro, son of Emperor Jahangir and Shah Begam are located. 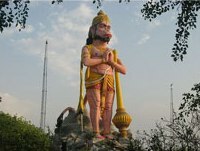 Hanuman Mandir: The Hanuman Mandir is located near the Triveni Sangam and is unique in North India for its supine Image of Hanuman. The idol of Lord Hanuman is seen in a reclining posture. 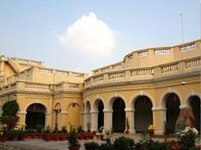 Swaraj Bhawan: It is old Anand Bhawan. In 1930, Moti Lal Nehru donated to the nation and named it as Swaraj Bhawan. At present it was houses of Jawahar Lal Nehru Fund and Children School of Creative Art. Anand Bhawan: It was the home of Nehru Family. Now it is a fine Museum which displays Memorabilia of Nehru Family. 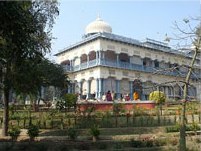 Many momentous decisions and events of Freedom took place in this Bhawan. Timings : 09:30am to 5:00pm and Closed on every Monday and on all Government Holidays. Dharmo Rakshati Rakshithah(SrivariCollections) 2011-2015. All Rights Reserved.